Finalists as seeding advised, on the early evening of Friday 13th April at the Gold Coast 2018 Commonwealth Games, the top two seeded pairs in the Men’s Doubles event emerged successful in the penultimate round contests. In the title deciding match, India’s Sharath Kamal Achanta and Sathiyan Gnanasekaran, the top seeds, meet England’s Paul Drinkhall and Liam Pitchford, the no.2 seeds. Sharath Kamal Achanta and Sathiyan Gnanasekaran, after a somewhat hesitant start, beat Singapore’s Ethan Poh Shao Feng and Pang Yew En Koen (7-11, 11-5, 11-1, 11-3); the teenage partnership having excelled expectations. Success for Sharath Kamal Achanta and Sathiyan Gnanasekaran meant that the possibility of an all Indian final existed; that option was extinguished by Paul Drinkhall and Liam Pitchford. 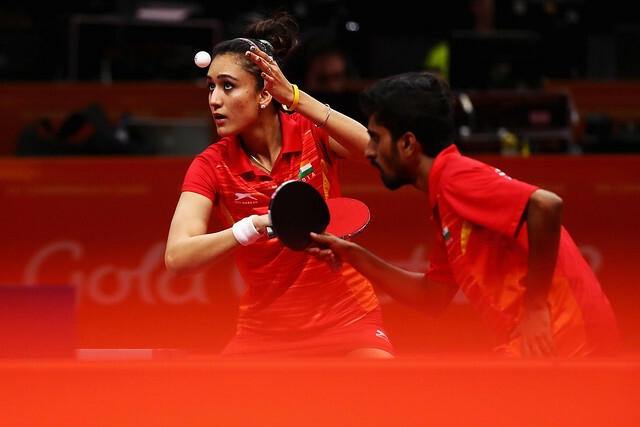 They beat Harmeet Desai and Sanil Shetty in four straight games (11-7, 13-11, 13-11). The final, featuring Sharath Kamal Achanta and Sathiyan Gnanasekaran in opposition to Paul Drinkhall and Liam Pitchford will be the contest that concludes the day on Saturday 14th April; it will be preceded by the bronze medal match in which Harmeet Desai and Sanil Shetty confront Poh Shao Feng and Pang Yew En Koen. A prediction for gold ? Too close to call.